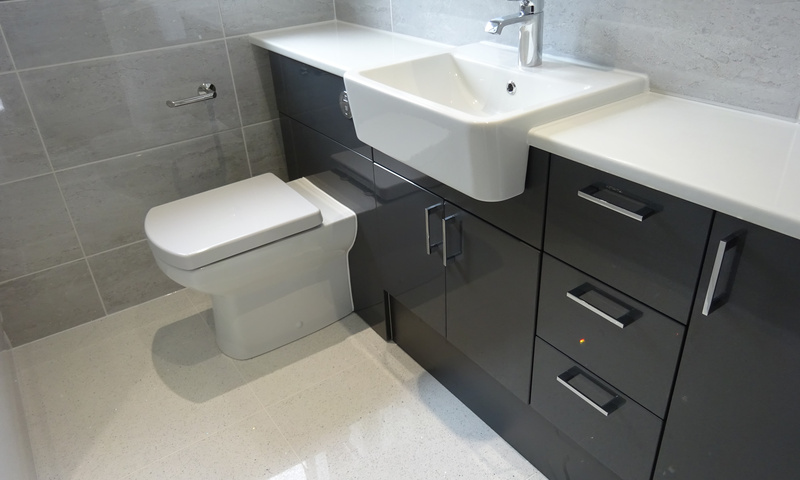 Modern bathrooms demand storage; however it is difficult in many bathrooms to fit any amount of storage. 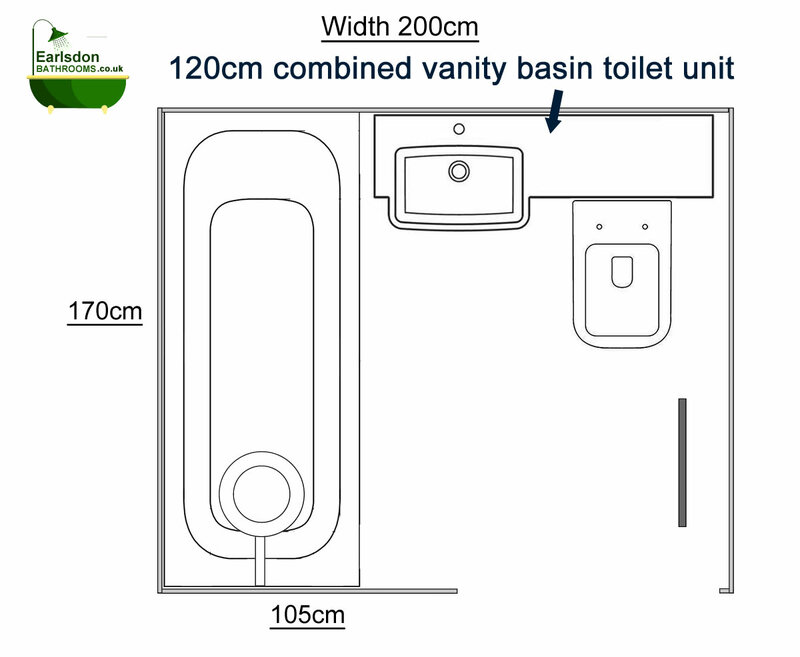 The examples below are based on older style houses with the center of the toilet roughly 30cm from the side wall. 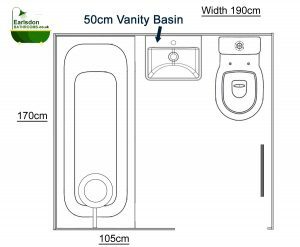 The bath measuring 70cm wide. 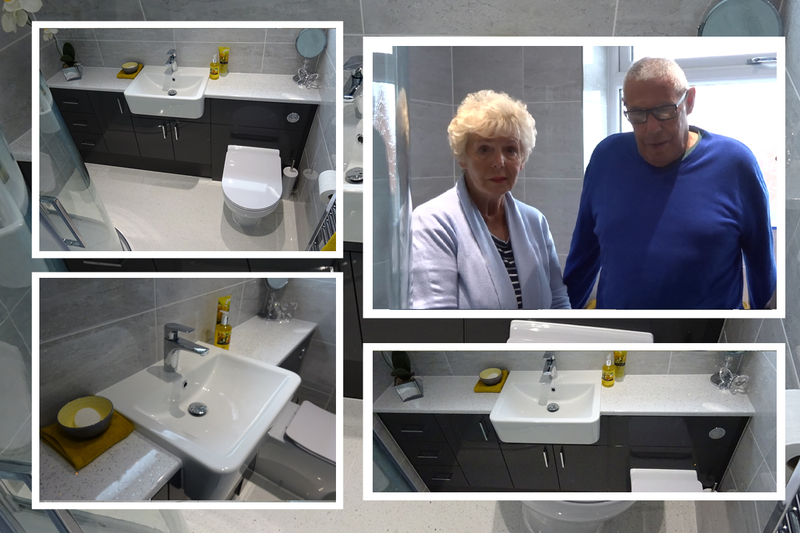 The bath end, basin and toilet all on the same wall. This is normally the window wall. 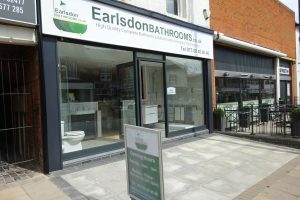 The soil pipe fitted to the exterior of the bathroom. 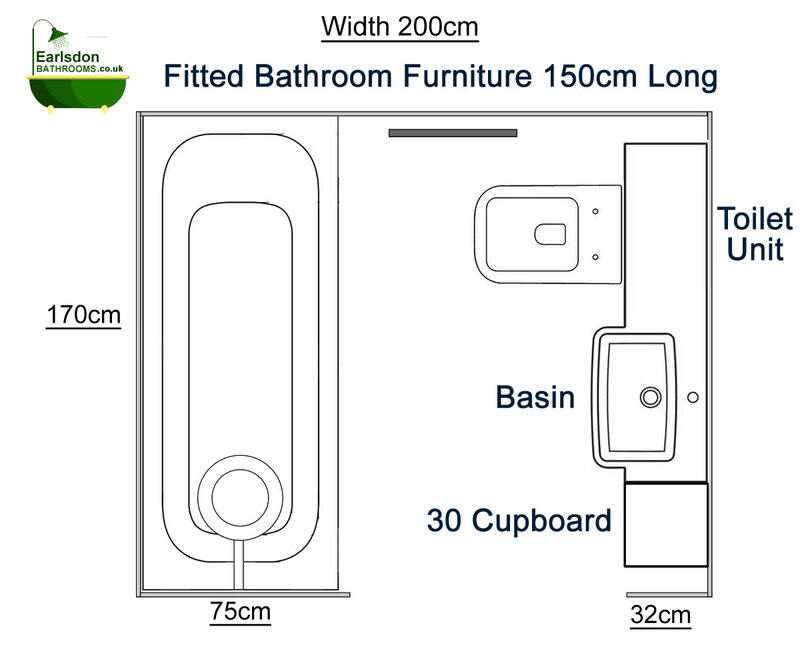 The measurements below are based on work with have completed and is only our opinion and should be taken as examples. 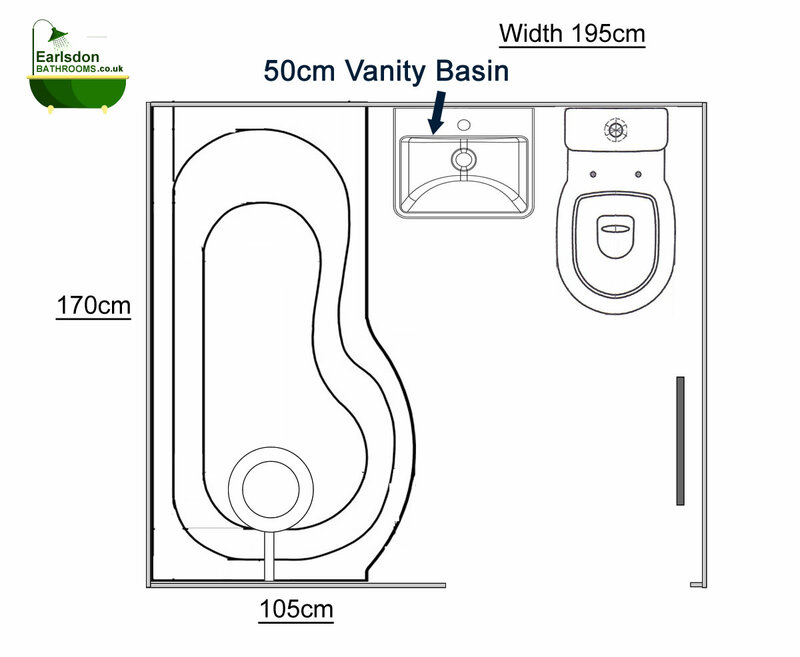 The bathroom needs to be around 1.9 meters (190cm) wide to be able to fit a 50cm standalone vanity basin storage unit. 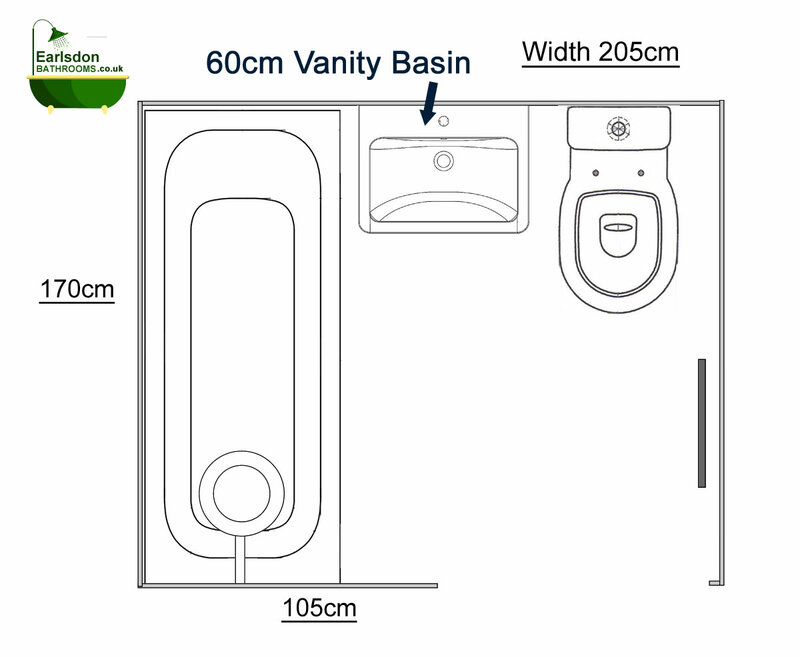 The bathroom needs to be around 2.05 meters (205cm) wide to be able to fit a 60cm standalone vanity basin storage unit. 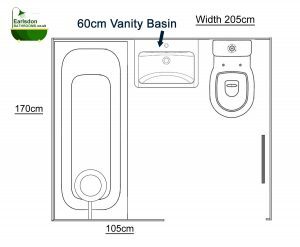 A 60cm vanity unit is normally deeper than a 50cm vanity unit so more space Is needed to ensure a conformable space is around the toilet. 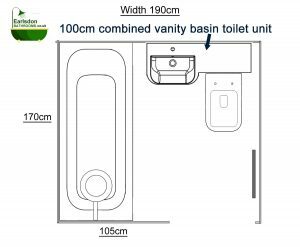 The bathroom needs to be around 1.9 meters (190cm) wide to be able to fit a 100cm combined toilet and vanity basin unit. 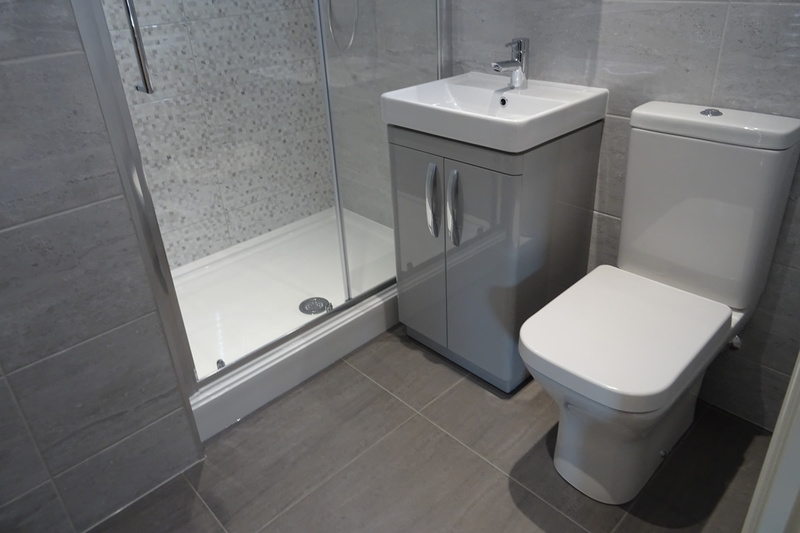 A space should be left between the end of the toilet vanity unit and the side wall to create enough leg room while to allow for sitting on the toilet. 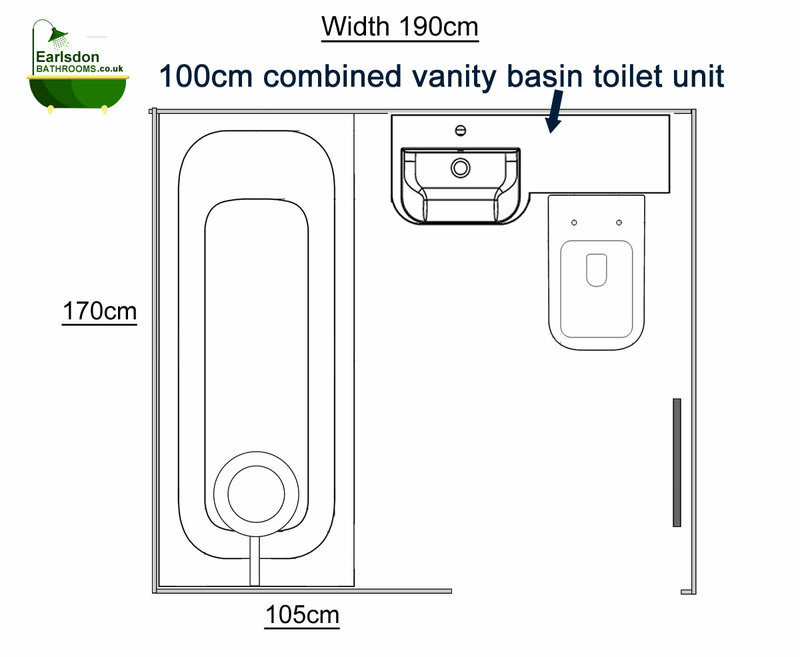 The bathroom needs to be around 2 meters (200cm) wide to be able to fit a 120cm combined toilet and vanity basin unit. 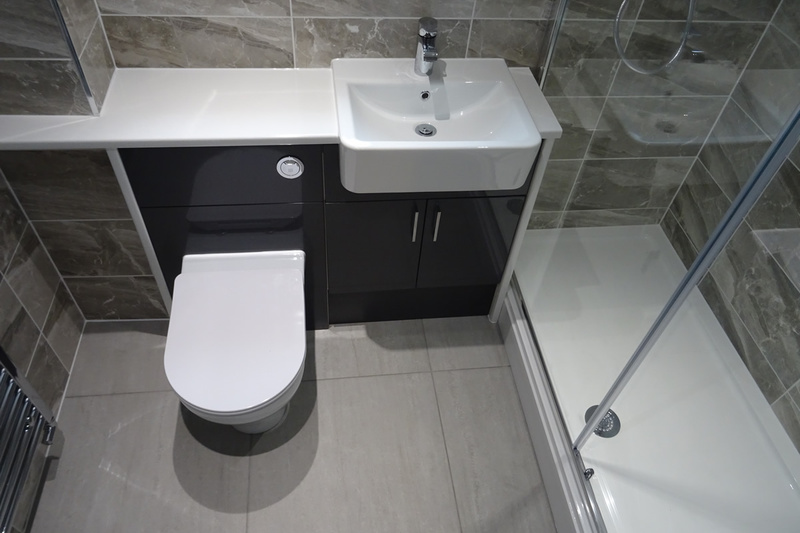 A space should be left between the end of the toilet vanity unit and the side wall to create enough leg room while to allow for sitting on the toilet. 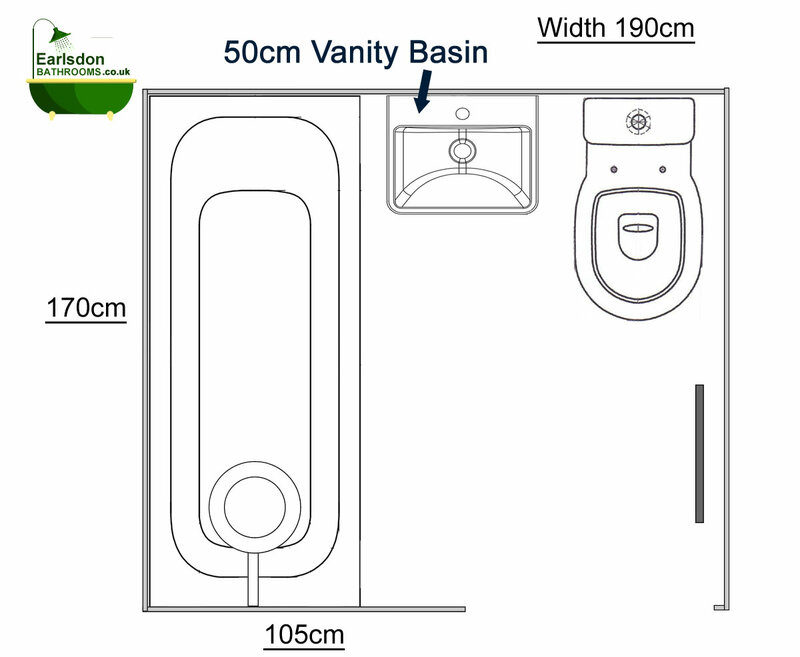 Most P shaped shower baths measure 85cm at the P end and 75cm at the narrow end. 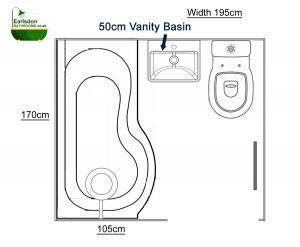 That is to say most off the shelf P shaped shower baths are 5cm wider at the narrow end. 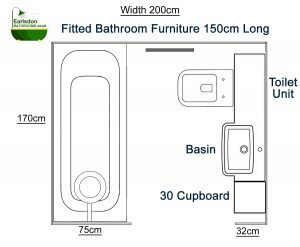 This means that a bathroom needs to be wider to accommodate a P shaped Bath with furniture against a standard straight bath. 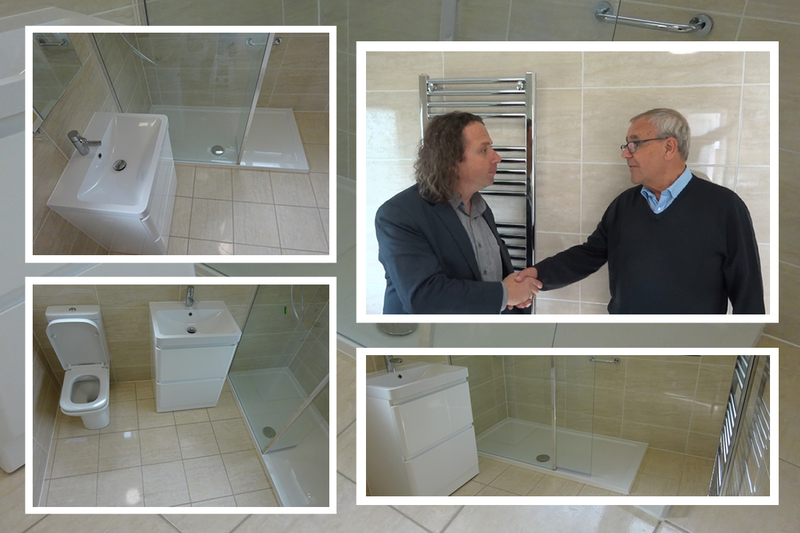 Changing the layout of the bathroom is possible if the bathroom is 2 meters (200cm) wide. 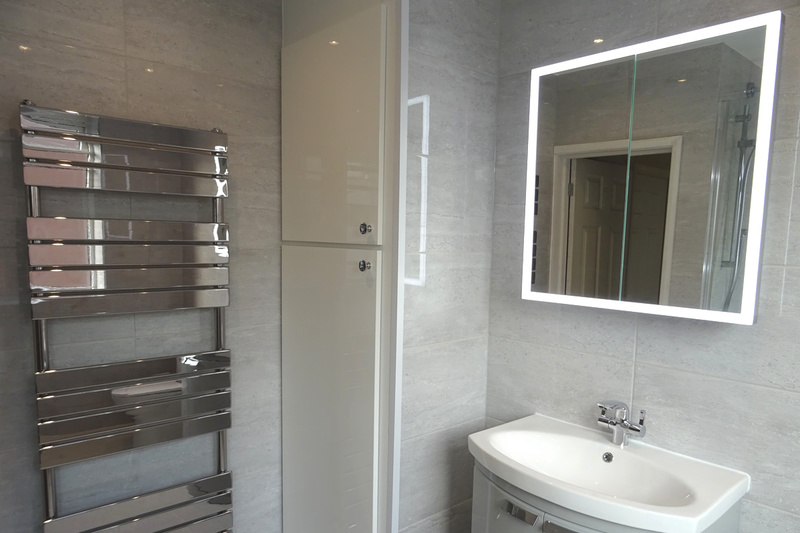 It is possible to fit fitted furniture on the opposite wall to the bath. 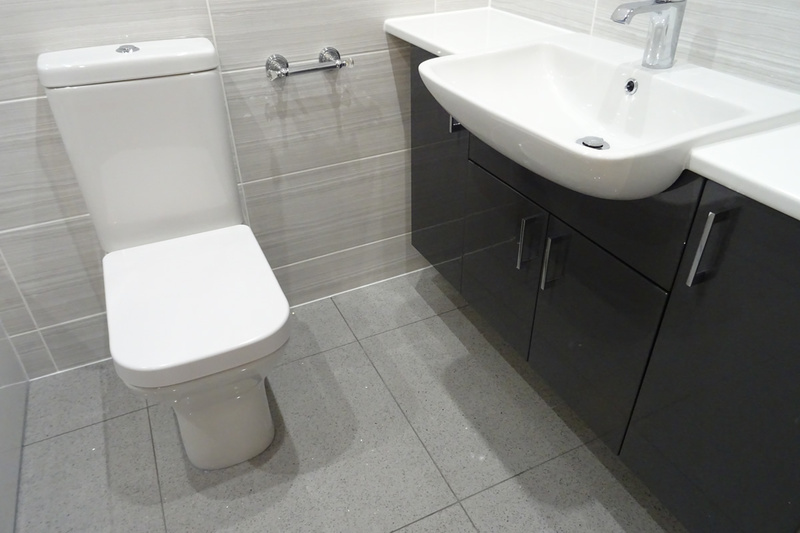 Standard width bathroom fitted furniture is 32cm wide and a toilet is roughly 50cm. 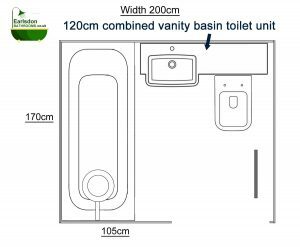 This will leave a space between the bath and the edge of the toilet at roughly 48cm. 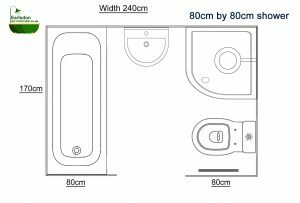 To allow easy access in and out of the bathroom it would be important that the space between the right hand side of the door frame and the right wall measures 32cm or more. 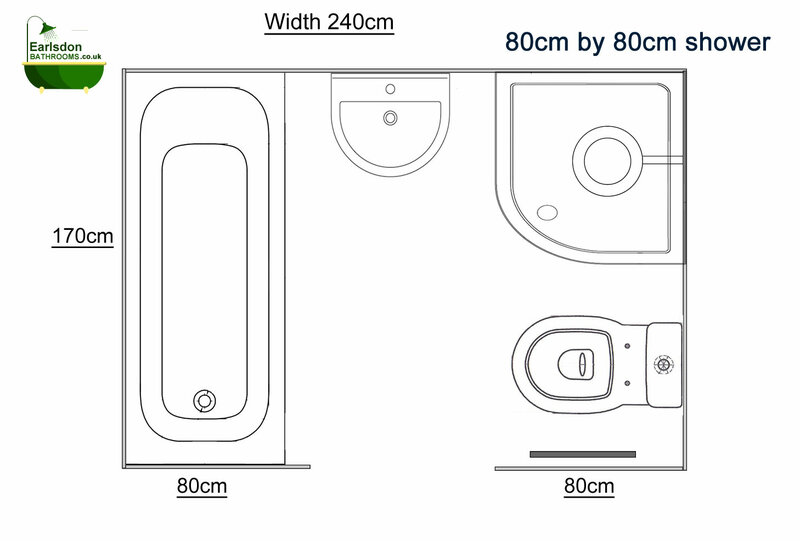 The bathroom needs to be around 2.4 meters (240cm) wide. 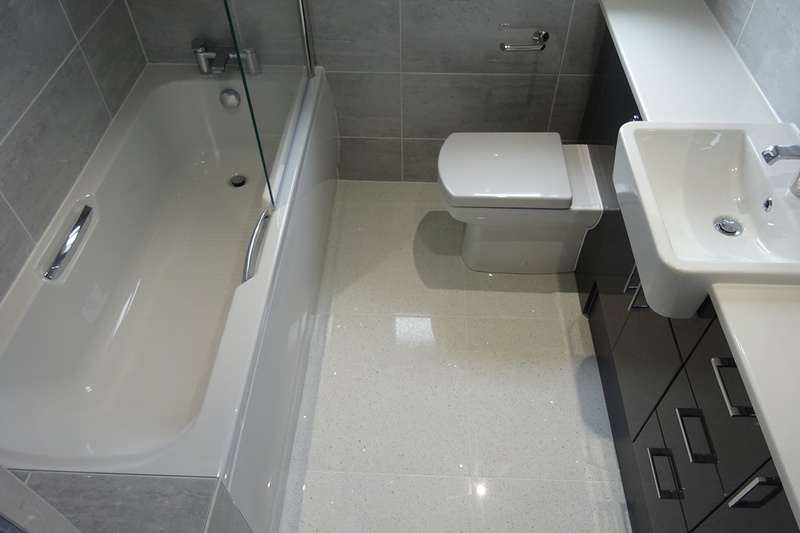 This is a drawing made from a bathroom that was originally a separate bathroom and toilet. 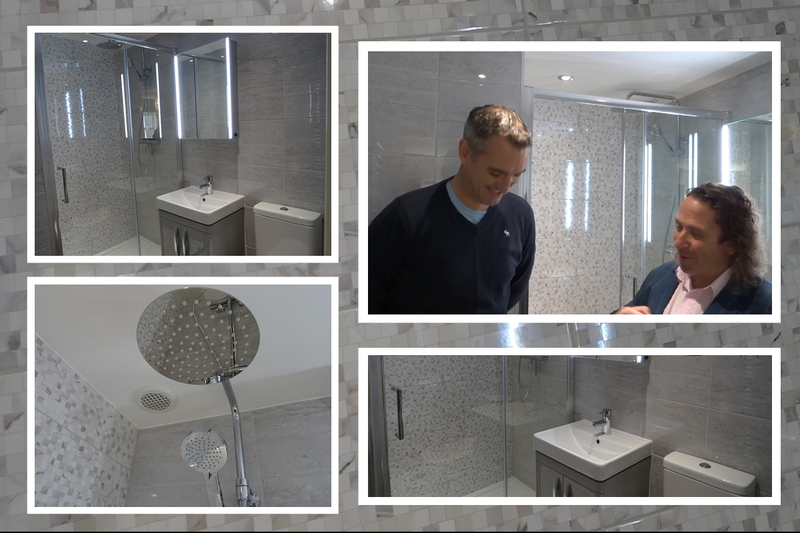 The shower enclosure is 80cm by 80cm quadrant. 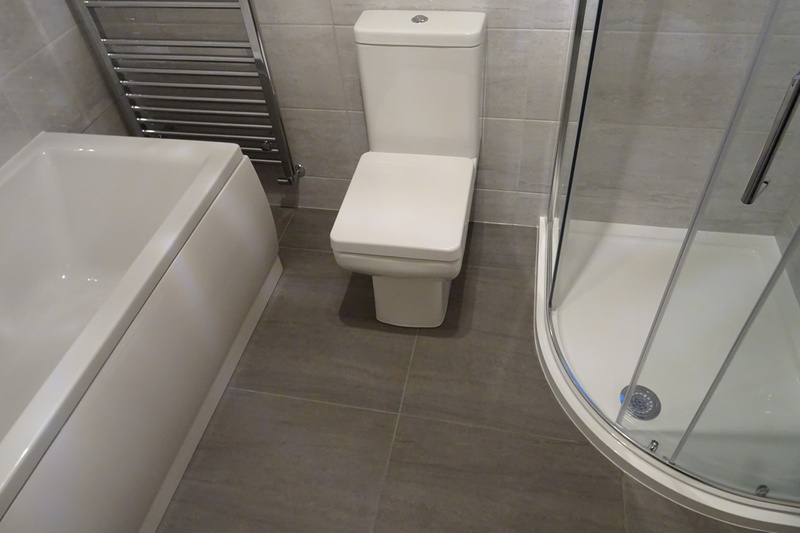 The curve on the quadrant makes it easy to access the toilet and move around the bathroom.